Inside Intramuros by the Pasig River is a quadricentennial landmark. It commemorates the galleon trade between the Philippines and Mexico during the Spanish colonial era. We came across this landmark as the kalesa we hired to tour as around was about to exit Intramuros at the northeastern side of the walled city. This is right along the Pasig River and near the Plaza Mexico station of the Pasig River Ferry. The galleon trade between Manila, Philippines and Acapulco, Mexico maintained the longest running trans-Pacific trade route in history. It ran for 250 years between the years 1564 and 1815 with more than 300 voyages undertaken by galleons built in both the Philippines and Mexico. Not only did this facilitate trade between Mexico and the Philippines. It also linked America with Asia and Spain with the Philippines. It also created close cultural ties between Mexico and the Philippines. The marker commemorating it's 400th year in 1964 can be found within Plaza Mexico inside the walls of Intramuros in Manila, Philippines. The quadricentennial marker of the Manila-Acapulco galleon trade is a concrete slab fronting the old Aduana building along Magallanes Drive and Riverside Drive. The concrete slab features an embossed bust of Spanish explorer Miguel Lopez de Legazpi in it's upper middle part, a ship's anchor on a hole near the upper right end. 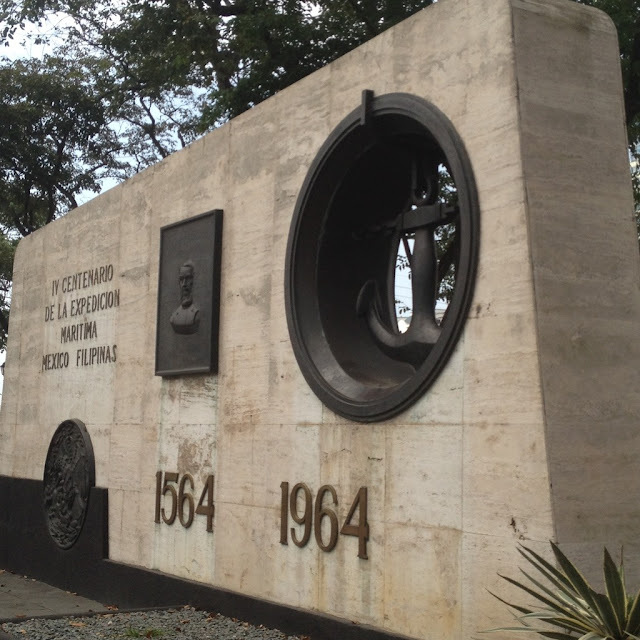 Below the bust of Legazpi is embossed "1564" and below the anchor is "1964" signifying that the marker commemorates 4 centuries since the trade route was started. On the upper left part of the marker reads the Spanish text "IV Centenario de la expedicion maritima Mexico Filipinas" in uppercase. Below it is a coat of arms.